Woodbury Chiropractic Center has been delivering quality holistic health care to Woodbury and the greater Tribury | Waterbury area since 1980. After studying in St. Louis and visiting other parts of the country, Dr. Levy and his wife, Amy, fell in love with Woodbury and its peaceful pace. Dr. Levy’s first office was in Middle Quarter near the former Phillips and Dotties Diner. He had a satellite office in Waterbury. He wanted to practice in one office in Woodbury, envisioning an older, country-style building somewhere on Main Street. 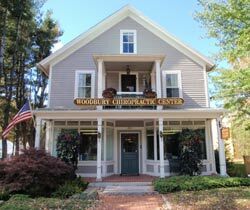 Woodbury Chiropractic Center is a Registered Historic Landmark, where local tradition and modern healthcare blend. He came upon his current building at 264 Main Street South, a former automotive store filled with Woodbury history. “In 1982, I bought this building which was Western Auto,” Dr. Levy said. Photographs of the couple’s six children. Aaron, Benjamin, Harrison, Jordan, Hamilton and Hannah, now adorn the country-style hallway of the historic Woodbury Chiropractic Center. No Obligation Visit | All Woodbury, Southbury, Waterbury and Watertown residents welcome! Here at Woodbury Chiropractic Center we have provided a no-obligation office visit for over 39 years. Regardless of your health goals, our job is to offer you the finest chiropractic care possible, and it’s up to you to decide how much of it you want. If you are looking for an experienced Woodbury CT area Chiropractor who can help, please contact our Woodbury chiropractic office to make a no-obligation appointment today. We look forward to meeting you in person and learning how we can help you take your first step towards better health. Delivering quality holistic health care to Woodbury, Southbury, Waterbury and Watertown communities since 1980.